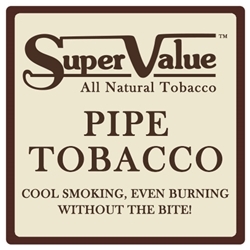 Super Value Pipe Tobacco is produced in the USA with all natural imported and domestic high quality tobacco blends. Super Value Pipe Tobacco is incredibly popular due to its distinctive fulfilling taste and flavor, with little to no harsh bite. Each style of these discount tobacco creations are mild in taste, delivery a smooth and easy smoke. Super Value Pipe Tobacco is produced by master blenders using a range of high-end techniques yielding amazing quality and flavor. Available in a variety of exotic styles each packed in specially designed flavor lock pouches, keeping this great pipe tobacco fresh and ready to use for a long, long time. Super Value Pipe Tobacco is produced and distributed nationwide by Sutliff Tobacco Richmond, VA. Distributed by Dream Castle Tobacco. Each pouch of Super Value Pipe Tobacco are available at our online tobacco store in Black Cavendish, Cherry, Vanilla Cavendish and Whiskey flavors. Switching to premium tobacco for your everyday smokes is a great alternative to expensive and over-priced retail brands. Choosing Super Value Pipe Tobacco ideal way to save money in an over-priced world. Here at Smokers Discounts we believe you should too! We’ve made it easy and affordable to buy Sparrow Pipe Tobacco online. Call us for more details!